Patent blue dye was injected in the subdermal part of the retroaroelar area in 167 patients having surgical treatment for invasive breast cancer. Three stage axillary lymphatic massage was performed prior to making the axillary incision for sentinel lymph node biopsy. All patients had completion axillary sampling or clearance. A blue lymphatic duct leading to lymph nodes of the first drainage was identified in 163 (97%) of the patients. Results are compared with 168 patients who had sentinel lymph node biopsy using blue dye without axillary massage. Allergic reactions were observed in four patients (1.2%). Three stage axillary lymphatic massage improves the successful identification of a blue sentinel lymph node in breast cancer patients. We injected 2 ml of 2.5 per cent undiluted patent blue V sodium dye subdermally in the retroaroelar area at the upper outer quadrant of the breast. The lymphatic massage was performed in three stages. In the first stage the axilla was massaged to empty axillary lymph nodes (Fig. 1). The lymph node massage was performed with the tips of two or three fingers. These were placed over the nodes, and pressure was applied like a gentle "scoop" in the direction of further flow from them. The fingers did not move over the skin; rather, they applied pressure during the "scoop" and released it . In the second stage a retrograde massage was undertaken from the axilla towards the injection site. This was performed using the palm of the hand and fingers using light stroking movements over the skin. The final step was to massage from the injected area towards the axilla (Antegrade massage) to drain the blue dye into lymphatics and axillary lymph nodes (Fig. 2). The three stage massage takes about one minute to complete. It uses light-pressured strokes in a specific direction to stimulate the lymph vessels just below the surface of the skin without increasing blood circulation or reaching the depth of muscle tissue. 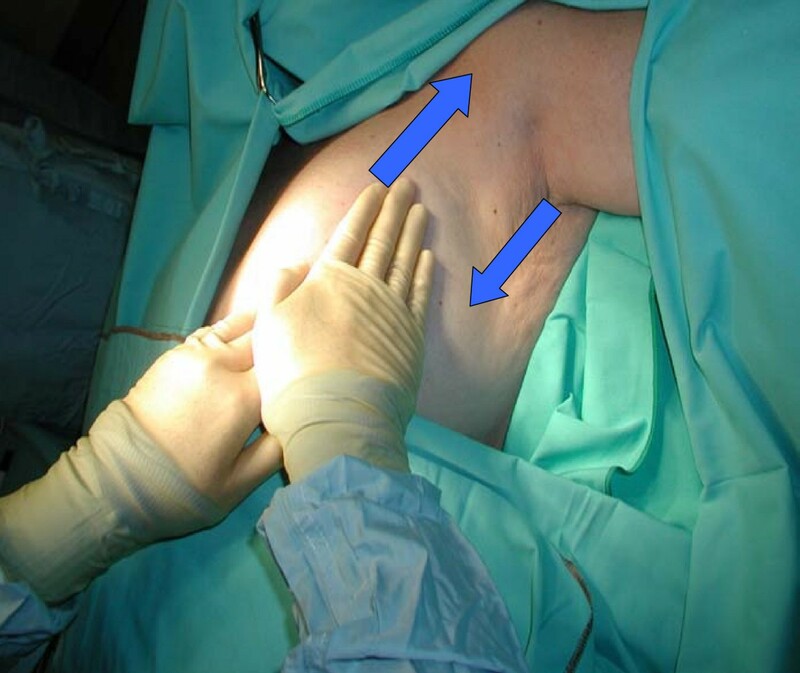 It was thought necessary to allow about seven minutes before making the axillary incision to provide the blue dye enough time to reach the axillary glands. All patients had completion axillary sampling or clearance. First stage of axillary lymphatic massage. Stage 2 retrograde and stage 3 antegrade massage. In 167 patients with three stage axillary lymphatic massage a blue sentinel lymph node was identified in 163 patients thereby achieving a localisation rate of 97%. We compared the results with our previous technique of simple massage from the injection site towards the axilla (Antegrade massage). A blue sentinel lymph node had been identified in 144 of 168 patients with simple antegrade massage alone, a localisation rate of only 85%. Four patients (1.2%) developed allergic reaction to patent blue dye which manifested in the form of blisters or wheal and blue hives with bluish discolouration of the skin. One of these patients became hypotensive. All reactions occurred within 45 minutes of the injection and were treated by a single intravenous injection of 200 mg of Prednisolone. The false negative rate was 6% in the antegrade massage group and zero per cent in the three stage axillary lymphatic massage group. The new technique also improved the sensitivity and specificity from 70 and 88 per cent with simple antegrade massage to 84% and 100% with a three stage massage. Axillary sentinel lymph node biopsy allows a minimal invasion of the axillary area in order to obtain a limited number of axillary lymph nodes to identify patients who do not have nodal metastases. This avoids a more extensive axillary dissection with its associated complications. It is important that techniques used to localise the axillary sentinel lymph node in breast cancer are optimized to achieve a high identification rate. A combined technique using Tc-99 isotope and patent blue dye has been shown to achieve a localisation rate of up to 98% [1, 9, 10]. Of the various dyes used for sentinel node localization patent blue dye is currently recommended for sentinel node biopsy in breast cancer patients in the United Kingdom. When injected subdermally in any area of the breast it binds to proteins and is absorbed by the lymphatics and highlights the lymphatic drainage and the sentinel lymph node in the axilla . Three stage lymphatic massage works by first emptying the "reservoir" in the lymph nodes creating an empty space into which lymphatics containing the blue dye can be emptied easily . A localisation rate of over 90% is currently recommended to assure quality in breast cancer surgery [7, 12, 13]. We report in this study that a localisation rate of 97% is achievable by using blue dye alone with axillary lymphatic massage in three stages. This technique can be useful for breast surgeons working in breast units where facilities for nuclear medicine are not readily available . A blue dye assisted four node sampling can be performed making it a targeted axillary sampling . A comparison of Methylene blue dye and combined dye and radioactive technique has shown that the blue dye technique with breast massage can be as accurate as the combined isotope dye technique . We thank all patients who have taken part in this study. Written informed consent was obtained from the patient for publication of images in this paper. A copy of the written consent is available for review by the Editor-in-Chief of this journal.